Want to learn more about the favorite lessons from our Grade 7 Math curriculum? Check them out here. The Top Ten 6th Grade Math Lessons were a big hit, and we loved hearing your feedback and responses. We’re already seeing some of those lesson suggestions in our Open Up Resources 6–8 Math User Community and on Twitter using #OpenUpMath. Seeing students engaged in the Top Ten 6th grade lessons made us even more excited to get out our Top Ten 7th Grade Math Lessons post! As we began looking through last year’s survey data, it was evident that lessons involving proportional relationships and reasoning were at the top of educators’ lists. These lessons are a great place for new users to get started, and for experienced users to focus in and make sure students are making the conceptual connections needed in 7th grade math. We can’t wait to see your students in action! Kids are sure to remember this tasty lesson where they must determine which two mixtures taste the same. 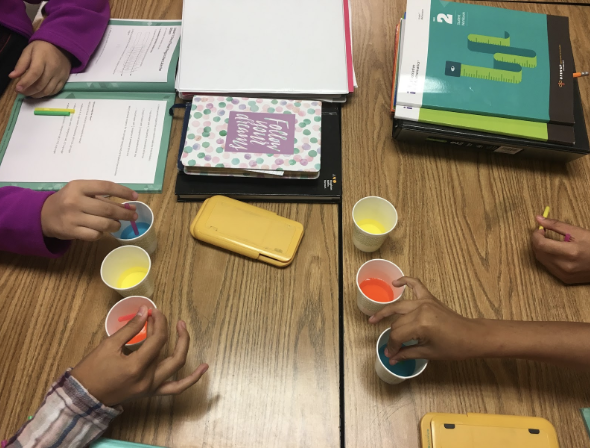 Students must prove their hypothesis using double number lines or discrete number lines, making this a visual and tasty way to begin learning about ratios and proportional relationships. Students gain valuable experience with proportional relationships by adjusting recipes for bread and rice so they can feed a larger crowd. Using ratio tables and double number lines, students begin to recognize the constant of proportionality between two related quantities. Most importantly, there are multiple opportunities for students to build their mathematical vocabulary in this lesson. This lesson is the perfect way to connect students’ understanding of proportionality to the circumference of a circle. 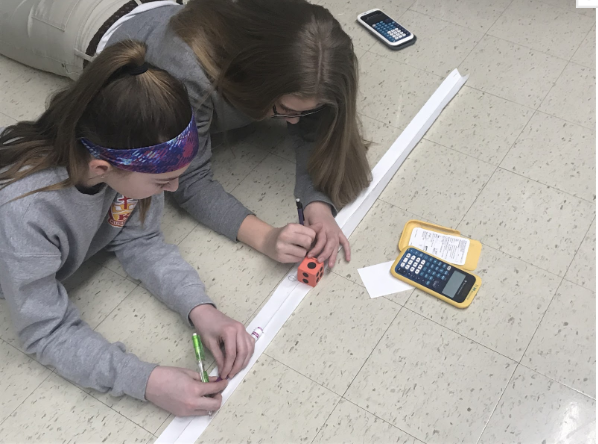 Students measure the diameter and circumference of circular objects to discover that the circumference divided by the diameter always results in pi. There is also an interactive applet that allows students to see the relationship visually. Students learn to fluently add integers while exploring climbing mountains and spelunking in caves and caverns. The interactive applet gives students a great visual representation of adding integers on a number line while the context provides valuable real-world insight into adding positive and negative numbers. This two-part activity begins with students drawing tape diagrams for stories that all deal with the numbers 7, 9, and 30…a tricky task! Part two allows them to participate in a card-sorting activity where they must match each tape diagram and story with an equation and then solve the equation. It is layer upon layer of critical thinking and reasoning with equations. Students take what they learned about solving one-step equations with hanger diagrams in 6th grade and expand that knowledge to solve two-step equations. The visual representation of keeping the hanger balanced is a great reminder of the steps to solving equations and provides the perfect transition as students move from concrete to abstract algebra. In this hands-on lesson students use pattern blocks to reason about adjacent angles to find the measure of unknowns. The digital applet allows for a technology-enhanced version of the activity as well. Once students have reasoned about the angles of each pattern block, they are able to use pattern blocks as tools to measure and estimate angles before switching to protractors. 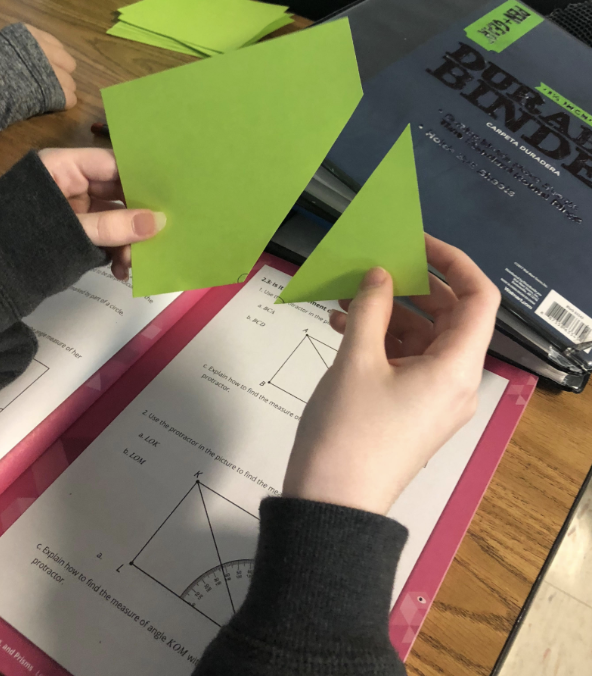 Students use small squares of paper to prove to themselves that complementary angles add to 90° and supplementary angles add to 180° by cutting the paper and then measuring the two angles created. This lesson makes lasting meaning of angle measures and relationships that students won’t forget. Teaching how to draw the 2-D cross-sections of 3-D figures can be one of the most challenging topics in 7th grade math. However, this engaging lesson includes both interactive applets and a card-sorting activity to keep students engaged while helping them visualize slicing a 3-D figure in multiple ways. Students “draw straws” of different lengths out of a bag to determine if a sampling method is considered fair. Students gain valuable procedural practice calculating a mean, while also deciding what makes a sample set a good representation of the population. We think this list will help you get off to a great start with Open Up Resources 6–8 Math in your 7th grade classroom. The Top Ten 8th grade lesson list is coming soon!